USB microphones are the easiest to use when you want to start podcasting. You basically plug them in and start recording. The other option is XLR microphones. These will require a mixer or USB interface. We don’t want to worry about that when you want to get started quickly. Typically, XLR mics are “more professional” but that doesn’t mean there aren’t amazing USB microphones for pretty much any budget. One thing to keep in mind is how much background noise you will have in your recording area: computer fans, HVAC, traffic, etc. Condenser mics pick up more background sound and are best suited for quieter environments. Dynamic mics will sound better in a less than perfect recording area or if you have multiple people speaking into separate mics. I favored USB mics that included headphone monitoring jacks as it’s important to listen as you record, so you might as well get used to it now. Combine one of these mics with a pair of closed-back headphones that fit your budget and a microphone desk stand and you’ll be off to a great start! Quick note: If you’re looking for a USB-C mic, you can simply get a USB-A to USB-C adapter. I know nearly everyone mentions the Blue Yeti as the top USB mic, but it’s for good reason. For its price point (around $120) you get the best bang for your buck by far when it comes to both sound quality and features. If you can find it for under $90 like I have a few times for Prime Day or Black Friday, don’t hesitate in grabbing one (or 2). Bidirectional is great for in-person interviews and omnidirectional is great group chats or conference calls. Having all this flexibility in one mic makes it the best choice for new (and experienced) podcasters. They have included a 0 latency (no delay) headphone monitoring jack, gain control and a mute button that flashes when muted. Blue also has a Yeti Pro model that includes both XLR and USB connections. One downside is that the mic is fairly heavy. I’ve heard that cheaper boom stands have trouble holding it up. I personally use the Heil PL2T boom with the Blue Radius II shock mount to hold and suspend the mic upside down and it works great. Check out some other Blue Yeti accessories here. Let me first start off by saying there is a big difference between the AT2020USB and the AT2020USB PLUS. With the Plus model, you get a headphone jack with level control and a mix control dial that allows you to blend pre-recorded audio with your voice. The headphone jack alone is a must-have feature if all you are just using a USB microphone. There is zero delay between what you say and what you hear when you use the jack on the microphone. If you use the headphone jack on your computer there will be a slight delay – this will make you go crazy! I also want to point out that Audio-Technica makes a standard AT2020 model that uses an XLR connection as well as a USBi version that includes an Apple Lightning (iPhone/iPad) connection. All that being said, this is one of the best USB mics you can get for podcasting and voice work. It’s a condenser microphone, so it can pick up background sound easily, but it uses a cardioid polar pattern which means it picks up sound from the front the best. It is smaller and lighter than the Yeti, which makes it more compatible with different mic stands and boom arms. If you don’t need the additional pickup patterns, the AT2020USB PLUS is a better choice. 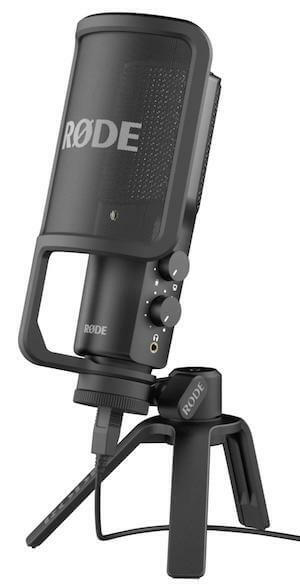 Rode has been making great audio equipment out of Australia ever since they entered the scene. The NT-USB is no exception. You get a zero-latency headphone monitoring jack and mix control (like the AT2020USB PLUS). They also include a pop filter that attaches to the base and sits at the ideal distance, desk stand and storage pouch. Another bonus is that it is compatible with an iPad if you use the camera connection kit. This is a great looking and top notch USB microphone by a quality company. You can’t go wrong here. Razer is known for computer gaming peripherals like mice and keywords, but as live streaming has become more popular it made sense for them to offer a microphone as well. The Razer Seiren Elite is a greatly upgraded (it’s really a whole different mic) version of their original Razer Seiren. They have changed the microphone capsule to a single dynamic element which is much better for gaming and added a high-pass filter. It has onboard gain and volume control, as well as a mute button and zero-latency monitoring through your headphones. We used to not recommend the older version, but this new one is great. Check out the best gaming microphones. 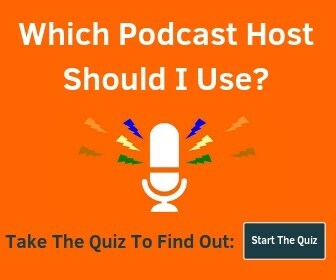 The Rode Podcaster is a new edition to this list, but not a new microphone. It’s a dynamic USB mic with a cardioid (front facing) polar pattern. There is a headphone jack with volume control for latency-free monitoring and a little green light to indicate it’s plugged in and working. Similar to the Yeti, this mic is really heavy so you’ll need to make sure you pick up a quality stand or boom arm to support it (it doesn’t come with one). 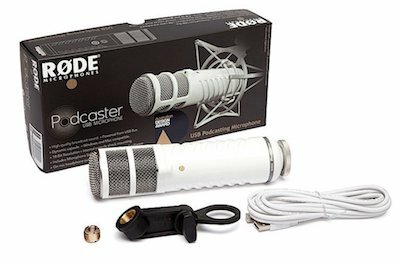 I’m partial to the Rode Procaster (XLR version), but if you don’t want to mess with audio interfaces and mixers, the Podcaster is a nice choice for a broadcast-style USB microphone. Just so you know, this one is slightly over $200, but it didn’t make sense to put it in its own section. Now we’re going to take a look at some lower budget USB podcast mic options under $100. Most are actually under about $70. I won’t say too much about this one here as we have a separate ATR 2100-USB review. My favorite feature is the dual USB/XLR outputs. It also comes with all the cables you need and a desk stand. It is designed to be handheld or on a stand, so if you want the option to use a USB mic by hand I would lean this direction. The ATR 2100-USB is a dynamic mic, so it is more forgiving in louder environments as well. It can easily make your voice sound nice and rich. It also works really well as a backup or travel microphone and the price point means you it’s not the end of the world should something happen to it. 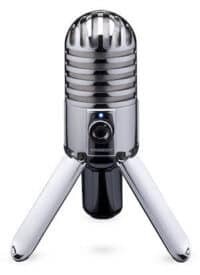 People like Pat Flynn and Tim Ferris use this mic for that purpose. For a sub $80 mic, this is a great choice. There are actually 2 models of the Blue Snowball. 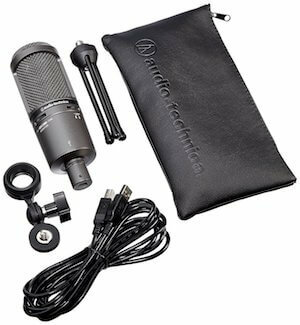 The standard model includes 2 microphone capsules, cardioid and omnidirectional pickup, and an adjustable stand. The other model is the Snowball iCE, which we mention a little farther down in the under $50 section. The Snowball is a plug and play USB mic although I have heard of issues with Windows 10. Without a headphone jack, it’s hard to recommend for podcasting. The Samson Meteor Mic is a sub-$100 USB condenser mic that includes a headphone monitoring jack. What else do I need to say? It works with an iPad with the Apple Camera Adapter, comes with a mic mute button, headphone volume dial and built-in legs. You really get a well-rounded and well-featured mic for under $100 – and it looks like a little rocket ship! The Blue Snowflake is closer to sub-$50 mics. 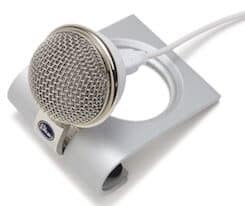 It’s a cardioid condenser USB mic that packs up very small. It’s a great choice if you need something to toss in your bag for travel. It sits right on the top of your screen or on your desk. The microphone pivots and swivels as well. The included USB cable fits right inside the case when folded closed – very cool! For USB microphones under $50, we’re not going to get all the features that really allow us to create the best recordings, but we get audio quality that is much better than what is included in a laptop. 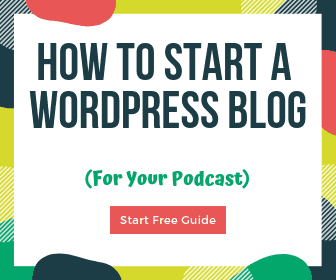 If you want to get started podcasting on a budget or if you want something you can travel with without fear of damaging, here are the best options. These are typically better than what is included with headset/mic combos as well. 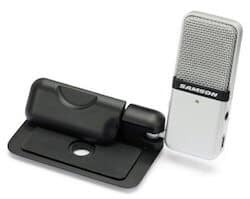 Designed as a travel microphone, the Samson Go Mic folds and includes a carry case. Like the Snowflake, it clips to your laptop or sits on the desk. It has a headphone jack for monitoring and has both cardioid and omnidirectional pickup. For the price and size, this microphone is perfect as a travel mic or a good choice for a cheap USB mic. The Snowball iCE has a single microphone capsule, cardioid pickup pattern (vs cardioid and omnidirectional with the standard Snowball) and a more basic stand. Definitely an upgrade from the built-in computer audio, but otherwise nothing special. The Samson Meteorite is tiny little ball mic that comes with a magnetic stand, allowing you to position the microphone in any direction. The price is typically the same as the Go Mic, so I would recommend that one over the Meteorite. 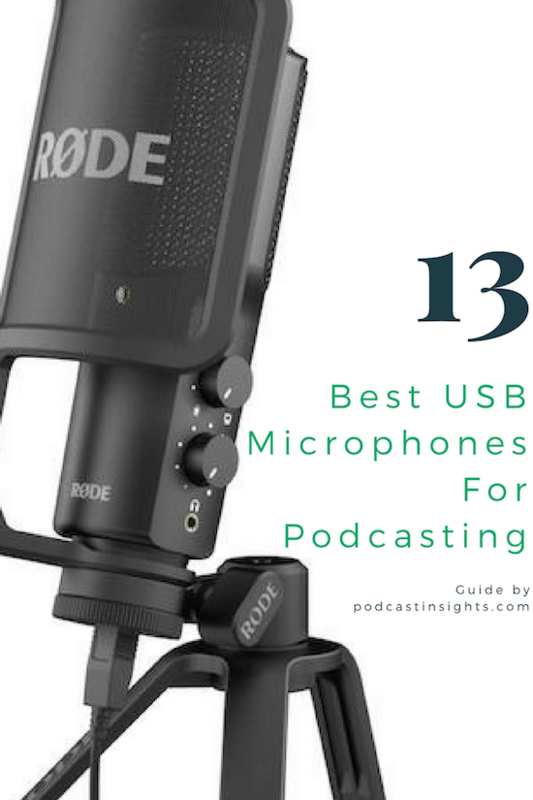 There are a few other popular USB mics for podcasting and voice. They are not our top recommendations. The Apogee Mic 96K is pricey and doesn’t include a headphone jack. Pass on this one. As we get time to test out more mics and get feedback from other people, we will update this section.